There were plenty of hints in the past few weeks, but now it seems clear as day: The Trump Administration plans, with the leadership of designated Secretary of Education Betsy DeVos, to trash the work of the Obama Administration to protect students from the abuses for predatory for-profit colleges. 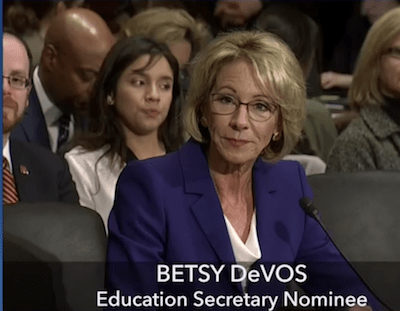 Billionaire DeVos, whose nomination is scheduled to be voted on by the Senate HELP committee this morning, is under fire for her lack of enthusiasm for public education, her weak commitment to civil rights, and her shaky performance at her confirmation hearing, where she demonstrated only limited knowledge of policy issues. Amid a pile of disturbing answers (and possibly plagiarized passages) from DeVos to written questions by Democrats on the HELP committee, DeVos responded this way to a question from Senator Elizabeth Warren (D-MA) about whether she would enforce the Department's 2015 gainful employment rule, which cuts off federal student aid to career education programs that, year-after-year, leave graduates with debt they cannot afford to repay: "The Department has had significant implementation issues with this regulation, including questions as to the accuracy of the data originally reported, the design of a system that would allow schools to challenge incorrect data, and the ability to provide the necessary technical assistance required. The last thing any of us want is to unnecessarily close down important programs -- putting students on the street with limited or no other options." DeVos deserves credit for being candid. She could have gotten away with saying a lot less. But her answer is ominous, because it clearly echoes the talking points of lobbyists for predatory for-profit colleges, particularly those of the discredited trade association of for-profit colleges, CECU, which is headed by former congressman Steve Gunderson (R-WI). Gunderson has repeatedly thundered that the gainful employment rule would cause millions of students to "lose access to higher education." The point of the rule is indeed to shut down some higher education programs -- those that, because of high prices and low quality, leave even their graduates earning too little money to pay down their student loans. Programs that leave for-profit college students -- veterans, single mothers, and others -- worse off than when they started are often sold through high-pressure, deceptive sales practices. Such programs absolutely should be shut down; indeed the gainful employment rule, while helpful, should be much stronger. New data released by the Department confirms what for-profit colleges feared as they have lobbied fiercely against the rule: Although the rule applies to career education programs at every kind of college -- for-profit, non-profit, and public -- 98 percent of the programs flunking the test in its first year were for-profits. Now, DeVos has laid the groundwork to destroy the rule. Although predatory for-profit colleges were salivating over the prospect of Trump, and pressuring his transition team, one could have at least hoped that he might continue the valuable work of the Obama Administration to fight against fraud by for-profit colleges, which have been getting as much as $32 billion a year in taxpayer dollars. Many of these institutions have been under investigation for fraud by multiple federal and state law enforcement agencies. Candidate Trump had pledged to fight against "}}">waste, fraud, and abuse with taxpayer dollars, to help working people get good jobs, to honor our veterans, and to drain the swamp of Washington corruption. And before the recent era, in which industry money has bought the GOP outright, Republican Administrations were traditionally committed to cracking down on for-profit college misconduct. -- At her confirmation hearing, DeVos declined to endorse the gainful employment regulation, telling Warren: "We will certainly review that rule and see that it is actually achieving what the intentions are." -- For-profit college lobbyist Gunderson's close family friend is former House speaker, lobbyist, and Trump cheerleader Newt Gingrich (R-GA), who has been a booster for Gunderson's industry and opponent of the gainful employment rule. -- One of DeVos's handlers at her hearing was Lauren Maddox, a Bush Administration Assistant Secretary of Education for Communications and Outreach who served on the Trump transition staff. A principal at the Podesta Group mega-lobbying firm, Maddox was a long-time registered lobbyist for CECU (previously called APSCU), for the predatory for-profit college company Career Education Corp., and for the student loan companies Sallie Mae and ECMC. Word among education lobbyists and Department of Education bureaucrats is that other for-profit college lobbyists are under consideration for top Trump Education Department jobs, including Dennis Cariello, who was involved with preparing DeVos for her hearing, and Diane Auer Jones. -- DeVos retains an investment in AEA Investors, which has a stake in Sextant Education, operator of a group of for-profit colleges, and she may also have an investment in for-profit giant Laureate Education. -- Of course, Trump himself has only one professional experience with career education, as the proprietor of the predatory, deceptive /www.huffingtonpost.com/davidhalperin/trump-testimony-in-the-tr_b_12995642.html"}}">Trump University, which late last year paid $25 million to settle fraud claims by students and New York's attorney general. "Swindlers and crooks are out there doing backflips when they hear an answer like this. If you can't commit to use the tools that are already available to you ... then I don't see how you can be the Secretary of Education." But DeVos likely will be Secretary of Education, simply because Senate Republicans, in thrall to the Trump regime, appear ready to vote for her -- although Senator Lisa Murkowski just said at the committee meeting that, while she would vote for DeVos in committee, she had not yet decided how she would vote on the Senate floor. Fortunately the swindlers and crooks backflips will be tempered by the reality of their dismal schools. DeVos's confirmation hearing answer produced a rally in publicly-traded for-profit college stocks, but it basically lasted a day. Even without the gainful rules, and other accountability measures that DeVos may be ready to throw away, continued investigative reporting on for-profit college abuses, advocacy work by pro-student organizations, and enforcement efforts by state attorneys general can help deter bad actors and protect the public from predatory schools. But a DeVos education department that sides with wealthy college operators over struggling students will disgrace itself and harm our country.